Did you download the eBook? Do you want to share you experience? Please do write your review about this eBook in the comments below, if you liked it, if you find it useful, if you have any suggestions and feedback! 1. What is Database Management System (DBMS)? 2. What do you mean by data processing? 3. List some database applications. 6. 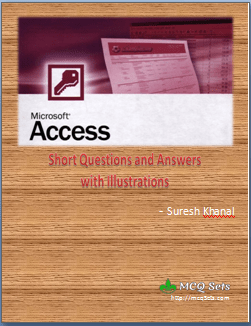 What is the extension of Access database file? 7. What is relational database? 8. What is a key field? 9. What is primary key? 10. What do you mean by foreign key? 11. What are the elements of a database? 12. What is a table? 13. What is a field? 14. What is a record? 15. What is a query? 16. What is a form? 17. What is a report? good quiz for exam. helps a lot for preparation. Very good for new learner. Many thanks for good share.